New for 2017/18 is the Mark Todd Cyclone Short Lace Boot. All of the Mark Todd Collection?s items are made from the highest quality materials, and designed to be comfortable and practical at the same time. All of their designs respect the fact that horse riders need to have the utmost of flexibility and comfort when riding. If you?re a rider, you?ll know just how uncomfortable it can be when your clothing is too tight - especially on hot days. 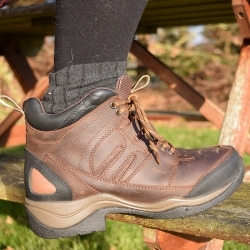 Every item in the Mark Todd clothing and footwear range has been developed to offer the very best in comfort and practicality. Their range of jodhpurs, for example, are figure-hugging and breathable, to ensure that you enjoy your riding as much as possible.